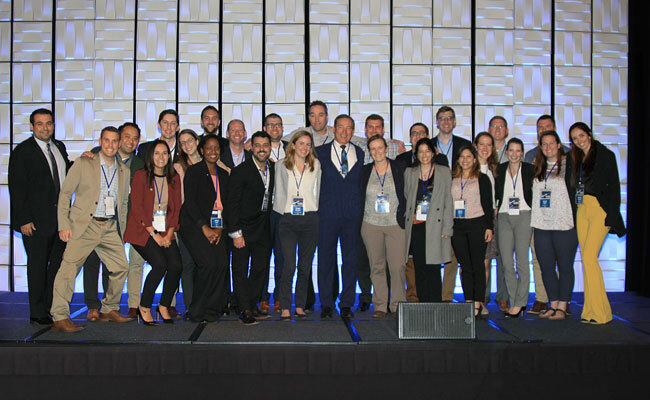 On November 16, 2018, Tetra Tech recognized the accomplishments of its 2018 Leadership Academy class at its annual corporate meeting, where participants received their certificates of completion from CEO Dan Batrack. The Leadership Academy prepares project managers to become outstanding business leaders to better serve our clients. Participants from across the company and around the world completed three intensive modules throughout 2018 to expand their understanding of Tetra Tech’s global operations and hone their operational, financial, and interpersonal skills. This year’s class included attendees from Australia, Brazil, Canada, Chile, and the United States. Throughout the program, Tetra Tech’s senior leadership work directly with the participants, share insights, and facilitate group exercises on topics including financial and risk management, contract terms and conditions, strategic growth planning, business development, and situational leadership. This program is a cornerstone of Tetra Tech’s platform of Leading with Science® to provide its clients with industry-leading services. As participants expand their Tetra Tech networks, they can offer their clients additional expertise and local market knowledge, backed by the support and power of a 17,000-employee company. Throughout the year, Leadership Academy participants shared and discussed best practices, with each employee contributing personal experience about the best way to approach situations. Participants report that learning directly from Tetra Tech’s executive management and from other participants encourages them to think creatively to find the best solution for each project, not just what has been done in the past. “The initiative, creativity, and motivation shown by the Leadership Academy participants reflects Tetra Tech’s core values,” said Tetra Tech CEO Dan Batrack. Since the program’s inception in 2013, nearly 200 employees have completed the year-long program. Alumni go on to be some of Tetra Tech’s top leaders and are tasked with special assignments, participate in corporate initiatives, and collaborate on strategic pursuits. We congratulate this year's graduates and look forward to seeing the great things they will accomplish for Tetra Tech.